I have waited a long time to write about Star Wars: The Force Awakens. Mostly because I wanted to get my thoughts together. The Force Awakens hearkens back to the original three Star Wars movies. In fact, some have complained that in many ways it's a remake of Star Wars IV which I don't think is quite correct. There are parallels. There's a cantina scene, for example. But it goes a different direction than the one in Star Wars IV. There is a scene where a character looks over a desert town from a height, which echos Mos Eisley ("A wretched hive of scum and villainy"). I, frankly, think this was done on purpose as an homage to Star Wars IV. This is rather like in the Star Trek reboot where they have echos of original Star Trek episodes and movies. And there was only one shot in the movie I thought that screamed "J.J. Abrams." Which was good. There are exciting sequences and it was fun to see familiar ships (such as the Millennium Falcon) in unfamiliar settings (flying around in a planet's atmosphere, for instance). There's a few problems such as the new Death Star-like weapon (the size of a planet) sucked in all of the sun to power its main weapon (never mind the mass and energy problems with that), but there was still enough light to see a light saber battle. I like that they humanized a storm trooper and I liked Finn. But my biggest problem was (and this is going to piss some people off) Rey. If Rey had been a man, no one would have believe the character. Rey is amazing (unbelievably so). She does the Jedi mind trick with no training. She battles a trained Sith with a light saber, and doesn't immediately lose. Sure, she's probably Luke Skywalker's daughter, but even Luke needed Yoda. And before that she expertly flew the Millennium Falcon, repaired it, and knew as much about it as Han Solo. And she'd apparently never been in it before she stole it, calling it a piece of garbage. Now I like strong women characters (see pretty much any of my books). But Rey was too competent, too amazing, too good too fast. As I said, if she'd been a man, there's be howls of how unbelievable the character was. I had other issues. The villain is weak, in my opinion, for one. But, over all, I enjoyed the film. The action sequences were fun and I didn't find myself thinking, "Oh, that's CGI" instead of "oh, look at that cool thing." 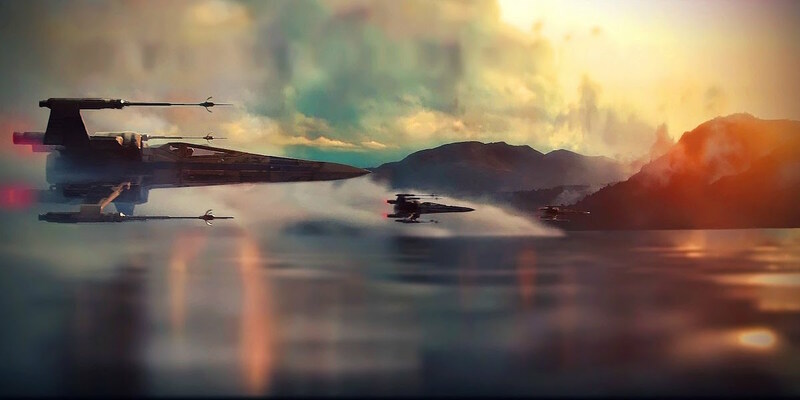 I loved the scene where X-wing fighters (slightly modified from the original films) skimmed along the water. So if Rey had been more believable, and the villain stronger, the movie would have been better. But it was still a fun movie.